Mr. Keshar Singh Rathore of Jodhpur, Rajasthan. His vision, experience and hard-work led to the formation of the Regal Group. The group is in business for more than 30 years and categorically in the furniture business for more than 12 years now, with Vishnu International, Regal Exports and Natural Living under its umbrella. Vishnu International, enjoys the status of a 100% Export company. Running in the Special Economic Zone(SEZ), it operates on a 40,000 Sq.ft. 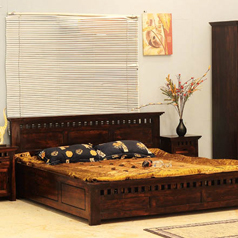 facility with all the necessary infrastructure required for export of wooden furniture. Regal Exports manufactures wooden furniture not only for the Indian customers but exports majority of its produce to European market. The quality and designs of the furniture produced by Regal Exports has been so impeccable that it had made them a top exporter and first choice in the European market. With years of experience in manufacturing and exporting top quality wooden furniture with modern designs Regal Group introduces “Natural Living – Furniture for Life”. A store, where you will get best quality wood, latest designs and finesse of handcrafted wooden furniture in one place. Currently, Natural Living operates 3 stores in Pune, 1 in Bangalore and very soon launching a store in its very own Jodhpur, Rajasthan. With big expansion plans, Natural Living would very soon be available in major cities, all across India. At Natural Living, we believe in our tag line, “Furniture for Life”. It means that a piece of wood when crafted into beautiful furniture becomes part of the life of its owner and it stays with them for their lifetime. 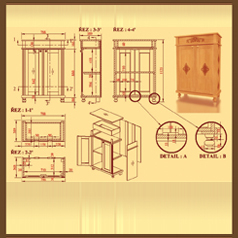 At Natural Living we create beautiful furniture which remains precious to you for your lifetime. Natural Living’s product range is recognizable with its brand, which stands for good quality and latest designs for our quality and design conscious customers. When we speak of design, we actually mean it. Fashion is an idea to create products which can beautifully adjust today’s life; therefore, our furniture is strongly influenced by various current trends and fashion. Our designers work regularly to produce new handcrafted furniture in both modern and antique designs. It is result of our constant efforts towards designing that Natural Living is able to launch new designs every month. 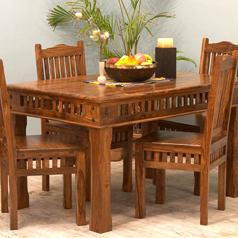 Our products are made of best quality Sheesham, Rosewood and Hardwood available in the market and our product range consists of Hardwood Furniture, Rosewood Furniture, Bed Room Furniture, Dining Room Furniture, Living Room Furniture, Furniture Accessories and other wooden articles. 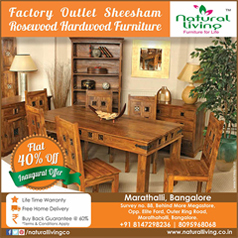 When we say that we provide best quality Sheesham, Rosewood and Hardwood furniture with modern and antique designs, then we provide them with the best price to our customers. We offer best value for all our products. You will always find our prices reasonable comparing it with quality, craftsmanship and naturalistic value of the products we supply. In the past years of our existence we have proved to provide the best price for pure Hardwood (Indian Sheesham/ Rosewood) available in the market. We have a buy back guarantee on the furniture purchased from us. Use our furniture for 10 years and we will buy it back at 60% of the value you paid for it. We provide lifetime warranty on all our furniture. 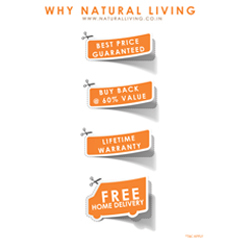 Natural Living Furniture has got stores in Pune, Jodhpur, Bangalore and Bangalore and we provide free shipping of our furniture in all these cities. Considering the continuous amount of love and support we have been getting from our customers, we will be present in all the major cities in India within no time.